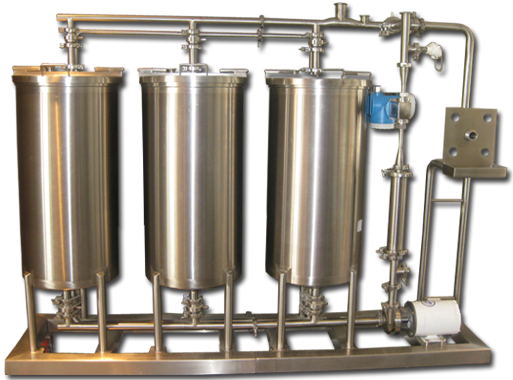 INOX-TECH has installed some 100 liquid yeast systems across North America and is considered a pioneer in the field. Cream Yeast Systems can be installed as a stand-alone or part of an overall Ingredient System. Our system can be as sophisticated or as simple as required by individual plants. INOX-TECH’s Automation Division can customize an instrumentation package with the precise amount of automation and troubleshooting capabilities you require. Depending on the PLC chosen, our technicians can have access to your process system by modem, allowing them to carry out off-site troubleshooting. Yeast recirculation is backed up with a two pump system with the possibility of each production pump being used as a back-up for the other production pump. Major components such as agitators, pumps and various valves have toggle switch backups to keep production recirculating. Push button Pail Drops with air-operated butterfly valve for emergency use! 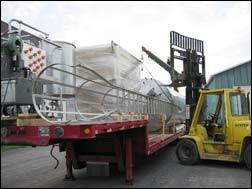 INOX-TECH personnel loading the components of a complete cream yeast system for delivery to customer’s facilities. INOX-TECH cream yeast systems improve sanitation and promote better microbiological control. Pump seals are specially designed for yeast application. Inox-Tech sanitation systems are designed with a strong emphasis on cost effectiveness. Volume of chemical solutions is adjusted to minimize water and chemical consumption. All systems built to strict sanitary and ASME standards and GMP.